Fast and accurate translation between multiply languages is one of the most challenging computing tasks. A lot of companies specialize in area and plenty of those offer limited dictionary and translational services online. And there is also Google (there is always Google). Nice Translator is online app that uses Google Translate APIs for fast translation from many to many languages. 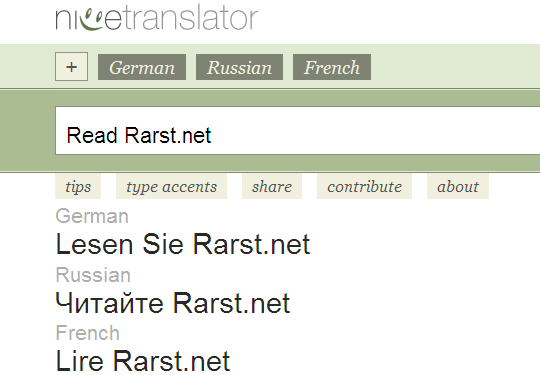 Site offers real-time translation of words you type in form. You can (and have to) select one or more languages to translate into. Language you type in will be auto-detected, but can be specified as well. Simple as that. There is no need to actually submit form or refresh page. Translation will begin to appear outright and adapt as you type words further. While it performs dictionary function perfectly, I miss a bit additional features of original Google Translate. Like quick translate of web page on URL input. It is slightly out of focus, but it won’t hurt to have such secondary functions somewhere in the corner for when it is needed. Nope, this one is purely dictionary type of service. For translating sites see main page of Google Translate.